Meal planning and grocery lists go hand in hand, right? I have explained a few times how important I think meal planning is, and having a list attached to that meal plan makes shopping that much easier. I don’t know about you, but I am way too busy to keep things in my head anymore! I always make my meal plan on Saturday and then make my grocery list right after. I keep it on my fridge throughout the week and add to it as I come across something we need. This cute grocery list matches the meal planning printable we talked about yesterday. You can use this for your weekly list or monthly list, however works best for you. I tend not to include things we need every time we shop, like milk and eggs. I put the items I need for a recipe or something odd we are out of that I know I won’t remember. Once again, you can print out as many grocery lists as you need, or print one and laminate it to use with a dry erase marker. I also have another version of a weekly grocery list and monthly meal planner if you want to check those out! Make sure to download your grocery list below! 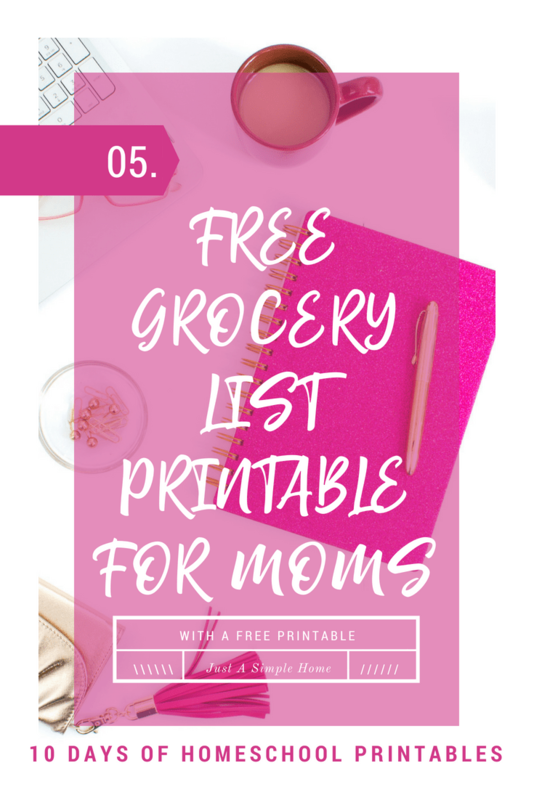 Grab Your Grocery List Printable! Download your free grocery list printable when you join our homeschool newsletter. Please check your inbox to confirm you want to join our community! You can look forward to free printables, tips for your homeschool journey and a free community for support! This post is part of a day series series of free Homeschool Printables for you! Click the button below to see all the posts and get all your free printables! I love that all of your printables are so pretty! It’s nice that you separated everything by category, too, making it easier to plan and to shop!